While we were tooling around Tulsa we ran into a shopping center that seemed to be the hub of all things necessary to one who was in need of food, drink and shopping. There was a Neiman Marcus, Starbucks and as Scott pointed out, a Flemings - his favorite. We made a mental note of its location and vowed to come back and dine there later in the week. And, here we are! Placed in a comfortable both facing the action packed kitchen and a view of the entire dining floor. We were introduced to the new wine iPad, vino at your finger tips! Ron placed his order for the Patz & Hall Pinot Noir and we dug into the warm Parmesan bread. The spreads were both fantastic, the sun dried tomato was my favorite. I saw Burrata on the menu and just had to order it as my starter. The heirloom tomatoes were not totally ripe but the spicy arugula, sharp onions and luscious beets more than made up for it. I had just one complaint, the lack of burrata - I ate it too quickly and wished their were more. It was lovely. 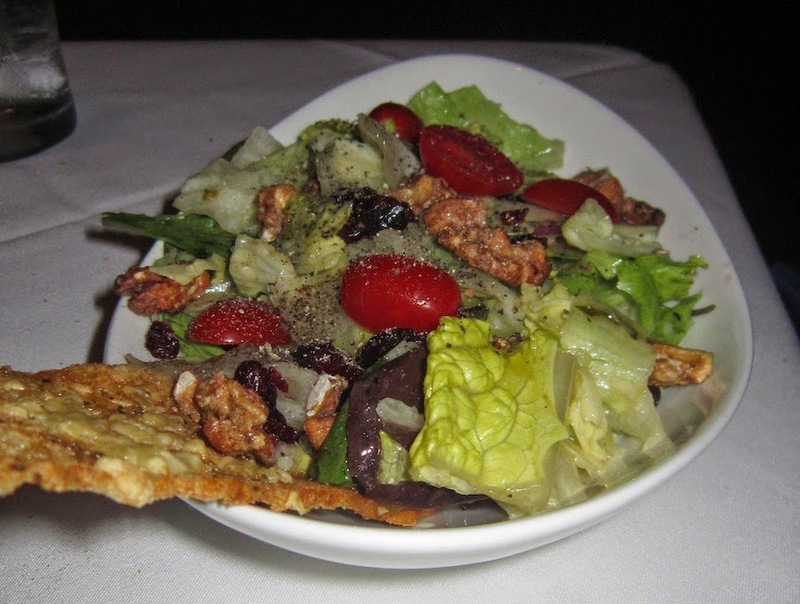 Scott ordered the Flemings Salad and it is was filled with all kinds of good stuff: red onions, tomatoes and candied walnuts just to name a few. The herbed crostini that was served with the salad was architecturally beautiful, and delicious too. Our plates were served quite spectacularly all lined up on this server's arm. We asked if he had ever dropped anything and he said he hadn't. I have never seen someone do this so I asked for his photo, he seemed really proud! Scott went for the Porcini Rubbed Filet Mignon, it was a center cut and cooked to a perfect medium rare. 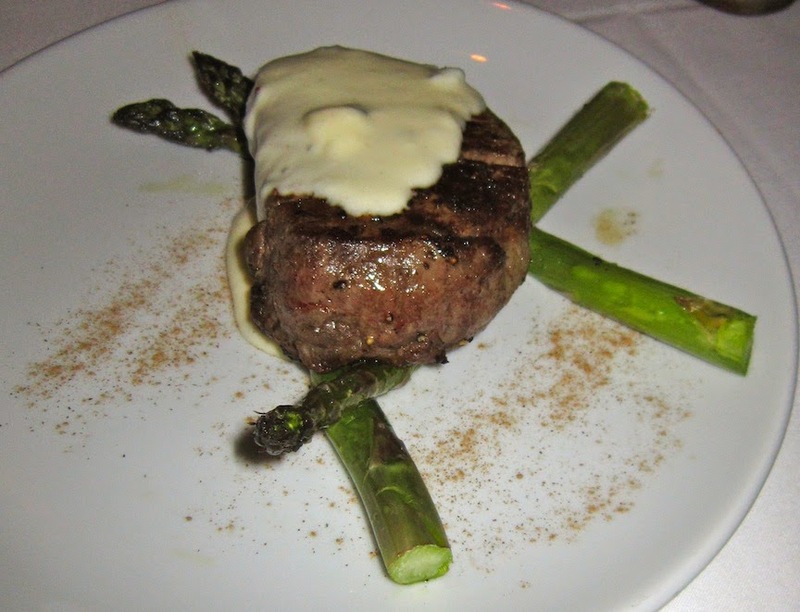 The sauce was a Gorgonzola cream and went nicely with his spears of asparagus. It was the perfect amount of protein. Cowboy Ron went big and ordered the Prime Rib-Eye. Now that is a piece of meat! Flemings serves the sides as family style so we ordered two to split. The one on the left was Creamed Corn topped with jalapeno rings and the one on the right was Fleming's Potatoes, their specialty scalloped potatoes with cream, jalapenos and cheddar cheese. Both were great compliments to our meals and could not be finished. Large servings! Are you wondering what I had? I had the fish special, I am THAT girl. The one who orders fish in a steakhouse, guilty as charged! The special was Covina and it appealed to me because it reminds me of a cross between sea bass and halibut. Two of my favorite types of fish! It was light, flaky and moist all at the same time. I love seafood! It was topped with a pineapple salsa that was kind of feisty with a generous serving of jalapenos. I loved the crab fritters that were served with the entree. Tasty! At about the half way point through our meal our server came by to see if we were interested in the Chocolate Lava Cake that took 20 minutes to prepare. We all had red wine left in our glass so we agreed it was probably a good idea. The molten cake came out hot and when swirled with the ice cream and cookie shell it was a treat. The Chantilly Cream was like a cloud! I give Scott credit for picking such a great restaurant, Fleming's is excellent! 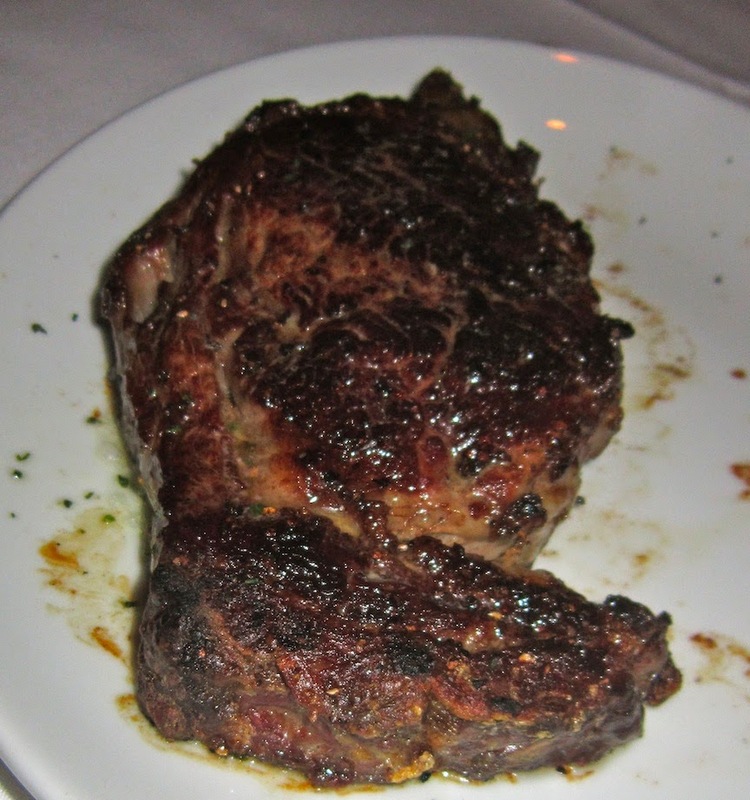 I learned a couple things from our server Josh, the founder of Flemings - Paul Fleming is also responsible for P.F. Changs. How cool is that?! It was said he created the restaurant because there were not any good Chinese restaurants in Arizona, where he was from, so he created one! How cool is that!